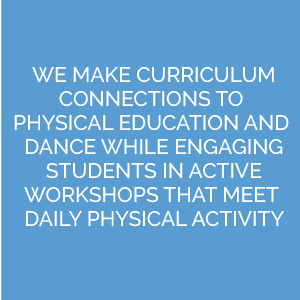 DANCEPL3Y OFFERs A VARIETY OF CURRICULUM-BASED WORKSHOPS FOR SCHOOLS TO SELECT FROM TO GET THEIR STUDENTS ACTIVE WITH DANCE! It’s time to let students get active and inspire them to PLAY with dance! DANCEPL3Y is an innovative and award-winning program that allows students to explore simple movements from a variety of dance styles from around the world (Hip Hop, Urban, Ballroom, Bollywood, Lyrical, Jazz/Funk and more!). DANCEPL3Y’s unique interACTIVE class style is paired with a positive coaching philosophy where every student can claim their “Bubble of Awesome”. Forget 5-6-7-8 or complicated right foot/left foot choreography – there are only 3 Rules of PLAY: Be Positive. Be Fun. Be Yourself™. DANCEPL3Y School Programs are specifically designed to promote positive mental health, meet curriculum expectations for H&PE and Dance and guarantee to meet Daily Physical Activity requirements. Voted #1 on the Discovery Education Channel! DANCEPL3Y school workshops have received international accolades for their positive impact on school climate, mental health and self-esteem as students learn and live the 3 Rules of PL3Y: Be Positive. Be Fun. Be Yourself. Ready to learn more and submit a booking request?